There are a number of processes one must go through while making a sales call. Making sure you cover all the ground you want to cover during the duration of the call can be a little tricky without the right help. That’s where the sales call checklist template from Microsoft comes in. 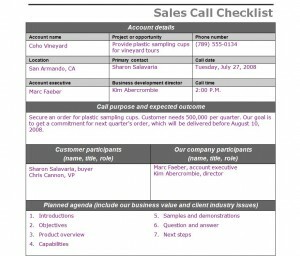 The sales call checklist template from Microsoft comes formatted with everything you need to make your next call a wild success. Businesses and companies will also love the fact that the sales call checklist available on this page is free! Simply click the link to download and get started today! The sales checklist is very easy to use. It comes in the form of a Microsoft Word template and can be filled out either on the computer or by hand. There are three pages to the sales checklist template from Microsoft. The first is a cover page for the checklist. The cover page has space for the name of your company, which version of the checklist it is, the date the checklist was published, who created or presented the checklist and an area for your company logo. The third page of the sales call checklist is identical to the second page but it is blank. The second page provides an example of what information you should include in the sales call checklist you will use for your business, while the third is blank and ready for you to customize it how you see fit. Make your next sales call a more efficient endeavor with the free sales call checklist template from Microsoft!